WordMeanings and Translation In Nepali of "Travelling Through The Dark". 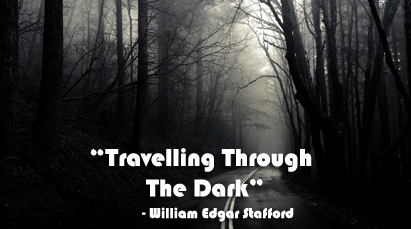 "Travelling Through The Dark" was written by William Edgar Stafford. William Edgar Stafford was an American poet and pacifist, and the father of poet and essayist Kim Stafford. William Stafford was born in Hutchinson, Kansas, on January 17, 1914. He received a BA and an MA from the University of Kansas at Lawrence and, in 1954, a PhD from the University of Iowa. During the Second World War, Stafford was a conscientious objector and worked in the civilian public service camps—an experience he recorded in the prose memoir Down My Heart (1947). He married Dorothy Hope Frantz in 1944; they had four children. Among his best-known books are The Rescued Year (1966), Stories That Could Be True: New and Collected Poems (1977), Writing the Australian Crawl: Views on the Writer’s Vocation (1978), and An Oregon Message (1987). William Stafford died at his home in Lake Oswego, Oregon, on August 28, 1993. Class 12 Course "Travelling Through The Dark"
Word Meanings In Nepali Of "Travelling Through The Dark"
Translation In Nepali Of "Travelling Through The Dark"
0 Response to "Travelling Through The Dark | Translation In Nepali | Word Meanings"